PERTH, Western Australia (4 August 2016) – Global technology company, acQuire Technology Solutions, has continued its support of Telethon Kids Institute, donating over $24,000 at its 20th anniversary celebration event held in Perth last night. The donation is part of acQuire’s Community Connect program aiming to make a difference to local communities around the world. With seven offices around the globe, acQuire make donations in each location that it operates. David Stephen, outgoing Managing Director for acQuire, presented the cheque for AUD$24,318.55 to the Director of Telethon Kids Institute, Professor Jonathan Carapetis, and his Head of Development, Tim McInnis. The unrestricted donation enables the Director of the Telethon Kids Institute to ensure that both small and large scale research projects, initiatives and/or resources can be funded. The institute aims to improve the health and wellbeing of children through excellence in research. 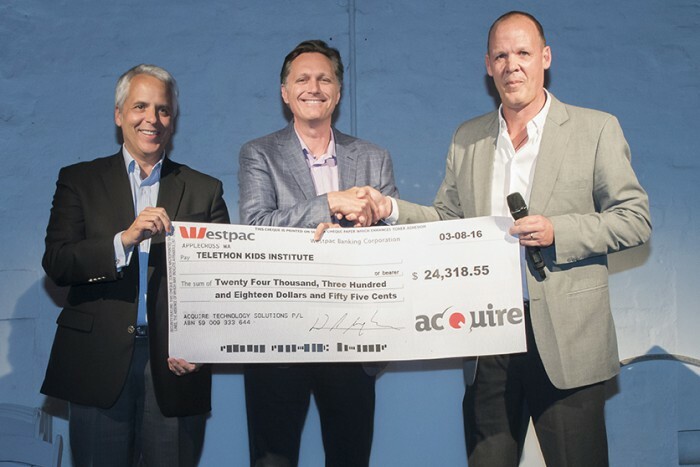 acQuire has supported the Telethon Kids Institute since 2004 and has donated a total of $270,480. acQuire’s support has made a significant and an ongoing difference. Last year, donations from the company were combined with other philanthropic donations enabling the Institute to purchase an “SGI Box”, a super computer specifically designed to handle big data coming from large-scale genomics projects. The machine is used to analyse the DNA of children with rare undiagnosed diseases. acQuire’s relationship with the Telethon Kids Institute began in 2004 when acQuire founder Bill Withers met former senior Institute researcher, Professor Peter Sly, on a plane and found similarities in their work. During their first meeting, Professor Sly explained the work of the Institute – specifically using social data analysis and then finding solutions to problems by integrating different fields of science. “He introduced me to an engineer designing a lung simulation device. I was suitably impressed and acQuire supported the Institute from that point on,” Withers said. “I shared my desire to support the community,” Withers said. acQuire continues to partner with the Institute based on this premise and each year our funds go towards a research project. acQuire celebrated its 20th anniversary in Perth on Wednesday, 3 August at Perth City Farm in East Perth. Celebrations marking the 20th year of business will roll out globally over the next month with events being held in Johannesburg, Santiago, Belo Horizonte and Brisbane. 2016 marks the 20th anniversary of acQuire. In 1996, acQuire launched Geoscientific Information Management (GIM) software solutions for the natural resources industries, focusing on exploration, resource development and mining assets. Due to an ongoing commitment to excellence, acQuire reinvests 20-25% of their annual revenue into research and development. The company currently employs over 100 staff working in seven offices around the globe, with support centres operating in each major time zone. More than 450 sites benefit from acQuire GIM solutions.